Del’s Famous Pizzeria and Italian Restaurant in Pismo Beach celebrates its anniversary over the four weeks of March each year. While some restaurants may celebrate their anniversaries, Del’s is truly among a category of rare places that can boast they’ve been cooking their popular Italian food for 40 years. TOP THIS! 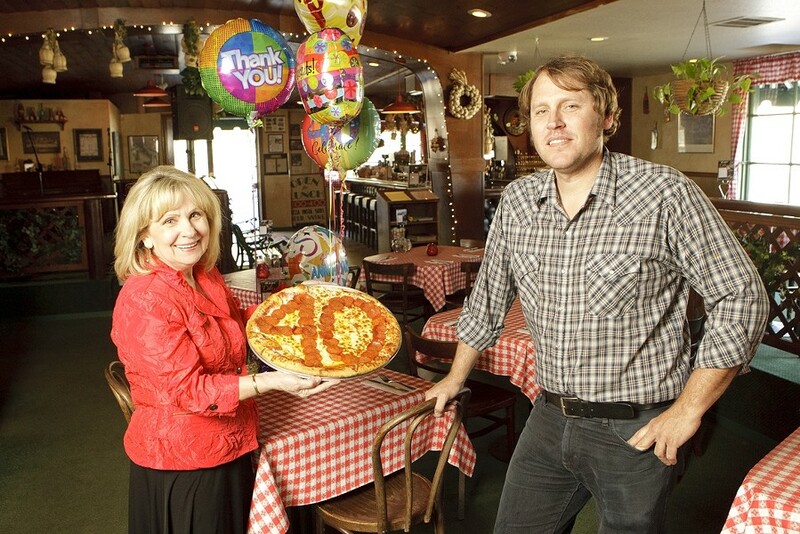 : Bernadette “Bernie” Donakowski—pictured here with her son Ryan, who manages Del’s—is celebrating 40 years of bringing pizza and other delicious Italian food to the county. “When we opened Del’s in 1973, there were only two other Italian places nearby: a fast food pizza place at the Madonna Plaza, and an Italian café called Lou’s in Grover Beach that served pizza and pasta,” according to owner Bernadette “Bernie” Donakowski. When Bernie and her former husband Jim Delmore opened Del’s, it was strictly take-out for pizza and pasta. Their prime location on Shell Beach Road, originally where Mei’s Chinese Restaurant operates now, allowed them to serve locals and tourists daily. The Delmores’ marriage ended, but Bernie kept the restaurant going to support her two young sons, Ryan and Darren Delmore. She credits her father-in-law, Ed Delmore, who originally loaned them the money to open the restaurant. “I’m grateful for Ed; he was my rock,” Bernie said, explaining that he helped her keep the restaurant going following the divorce. Given Bernie’s long successful history in South County, it’s not surprising Del’s is still going strong, and they’re proudly stating “This is 40” for an impressive four-decade run in the restaurant business. In May 1994, Bernie moved the restaurant to the larger location on Shell Beach Road where it has remained. The bigger kitchen allowed the addition of a professional oven for making their tasty rolls fresh daily. Not only that, this site provides plenty of parking out front or in their private lot. This record anniversary is reason enough to remind people how solid this old-fashioned eatery is for a casual night out. For families with small children, Del’s is very kid friendly, and it’s a real treat compared to fast food fare. Honestly, this is one of the best value restaurants in SLO County. HAPPY BIRTHDAY! : Del’s Pizzeria & Italian Restaurant is at 401 Shell Beach Road in Shell Beach. It’s open daily. Del’s 40th anniversary weekly dinner specials are: March 1 to 10, lasagna for $7.99; March 11 to 17, any calzone for $6.99; March 18 to 24, a large one-topping pizza for $10.99; March 23 to 31, spaghetti and meatballs for $6.99. This is for dine-in, take-out, and local delivery. For more information, call 773-4438 or visit delspizzeria.com. A recent visit for dinner, however, motivated me to review this classic eatery once again. I planned to join an old friend for dinner, and we both said we were craving pizza and thought of Del’s. This wine lover was totally excited by the wine list compiled by Bernie’s son Darren. A wine connoisseur himself, he’s the national sales manager for Tablas Creek Vineyard in Paso Robles. Of course he still helps his mom make Del’s wine list exceptional, and the prices are near retail—few restaurants are that generous, and I loved it. For instance, I enjoyed a delicious Stephen Ross 2008 Pinot Noir ($9/glass; $32/bottle). They also feature Talley 2010 Pinot Noir Estate ($36/bottle) and Tablas Creek Vermentino ($7.50/glass; $30/bottle). During March, only $2 gets you a “This is 40” commemorative wine glass to take home. Two years ago, Bernie added a draft cooler so they can offer locally crafted brews from Firestone Walker, Figueroa Mountain, and more. When we ordered our dinner, the friendly waiter was more than accommodating. My friend and I ordered the antipasto salad ($10.95), which was deliciously fresh and more than big enough to feed two people. The salad of mixed lettuces was topped with cherry tomatoes (the best choice when tomatoes are out of season), black olives, mozzarella cheese slices, salami slices, and pickled pepperoncini (also known as Tuscan peppers). This salad comes with two dressings on the side: balsamic vinaigrette and ranch style. Bernie suggested mixing the two on our salads, and they worked very well together. You also get a basket of the freshly baked house bread. For our pizza we asked for each half to have different toppings, no problem. We ordered the medium-sized pizza ($19.95 is the average price for medium), half Mama Del’s House Special generously topped with pepperoni, sausage, an array of veggies, and cheese, with the other half Pesto Gamberetti with pesto, prawns, ricotta, and garlic. Both were delicious fresh from the oven on their tasty house-made crust. I had two slices of each. I love hot pizza oozing with cheese, and Del’s really hit the spot. The old-fashioned red-and-white-checked tablecloths, basket-wrapped Chianti bottles (bearing flowers rather than cheap Italian swill), and photos of renowned Italian actors and singers on the walls, with the sounds of “Bella Notte” or “Amore” playing softly in the background are campy yet romantic. Today, Del’s is managed by Bernie’s son Ryan, whom I met while he was dining there with his family. Del’s brings us back to the 21st century during Spaghetti Western Mondays, a seasonal event (only two more weeks) when talented, up-and-coming Central Coast bands play strictly for tips. Bernie admitted that the last four years have been tough on the restaurant business. Fortunately, the Delmore family has survived this rough patch thanks to its loyal customers over the 40 years it’s served dinner (and lunch on weekends). Some longtime customers have moved on (in more ways than just relocating), but Del’s remains a favorite among its faithful regulars who love the comfortable, family atmosphere you find only in a traditional pizzeria like this one.